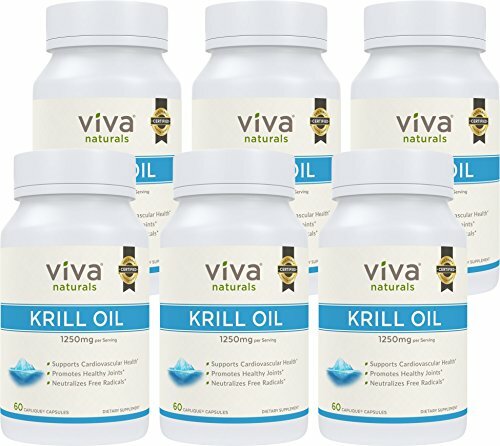 Why choose Viva Naturals Krill Oil? Two easy-to-swallow capsules give you a high concentration of active ingredients: 1,250 mg of krill oil, with 165 mg of EPA, 95 mg of DHA and 500 mg of phospholipids. Plus, 1.6 mg of a free radical-fighting antioxidant called astaxanthin. It's a choice you can feel great about. The omega-3s in krill oil are delivered in phospholipid form - just like those in your cell membranes. This was shown to be two-and-a-half times better absorbed than fish oil (delivered in triglyceride form), helping your body make the most of it. Unique Capliques® preserve freshness and cut aftertasteNot only is our krill sustainably harvested from the Antarctic without the use of hexanes, but our capsules use an innovative technology with a sealed band around the center, keeping the oil fresh and limiting any fishy burps, odors or aftertaste. Each batch of Viva Naturals Krill Oil is third party tested for heavy metals and impurities, and meets the International Krill Oil Standards Program's rigorous standards. So you can feel confident that you're getting the good stuff. HIGH CONCENTRATION OF OMEGA-3s PER SERVING - In two small, easy-to-swallow capsules, you get 1,250 mg of krill oil per serving, with 165 mg of EPA and 95 mg of DHA. And the omega-3s are delivered in phospholipid form, shown to be better absorbed than fish oil's triglyceride form. SUPPORTS HEART, BRAIN AND JOINT HEALTH* - Taking Krill Oil helps keep your heart healthy, and maintains healthy cholesterol levels already within a normal range. It can also keep your joints flexible, and give your brain the DHA it needs. FEATURES AN ANTIOXIDANT TO FIGHT FREE RADICAL DAMAGE*: Unlike fish oil, krill oil's got a powerful antioxidant called astaxanthin (the carotenoid that makes shrimp turn red when cooked). Ours gives you 1.6 mg of this important free radical scavenger. UNIQUE BANDED CAPSULES CUT FISHY BURPS* - Viva Naturals Krill Oil is housed in innovative Capliques® capsules, designed with a sealed band around the center to keep them fresh. IKOS CERTIFIED PURE - To keep nutrients intact, our krill is frozen right after harvesting (sustainably, of course). The oil is extracted without the use of hexanes, and is 5-star certified for purity by the International Krill Oil Standards Program.